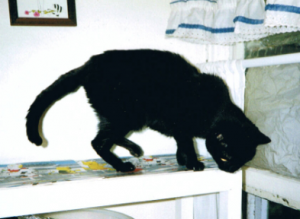 Spirit at age 20…her creaky old joints made it hard for her to access the litter box. Spirit Essences were named for this spunky kitty! House-soiling, or inappropriate elimination, is a common and frustrating cat behavior problem. It’s the most frequent behavioral reason for cats losing their homes by relinquishment to a shelter, exile to the outdoors, or even euthanasia. When a cat “goes” outside the box, she is not being vengeful or mean; she’s just trying to express her frustration about something happening in her world that’s stressing her. In the cat world, urine and feces are means of communication. Since she can’t talk, she’s using the best methods she has available. It’s up to you to decipher what’s being communicated. If your cat is house-soiling, there are a few things you shouldn’t do, including sticking her nose in it, yelling, or using any physical punishment whatsoever. These actions will only confuse her, and make her even more stressed out–and that, of course, can make the problem even worse. The top two reasons are: a box that’s not clean enough, and urinary tract issues. It’s easy enough to clean the box, but the second reason requires a veterinary visit. That visit should happen ASAP for male cats, especially if they are producing little or no urine despite multiple attempts (this can indicate a urinary blockage, which can be life-threatening). There have been thousands of pages written on feline house-soiling, and sometimes they’re hard to wade through. Hopefully this list gives you a good idea about where to focus your investigation! For more detailed information on litterbox issues, see our series on “Litterbox Secrets” in the Little Big Cat Library. If your cat has urinary tract issues, check out our special report, “Feline Lower Urinary Tract Disease” (and many others) in the Bookstore! ← Why Fix What Isn’t Broken?